The celebrated appearances of Theodore Stratelates in battles against the Rus are discussed in various historical writings. 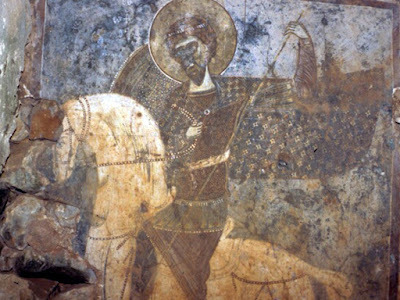 The Saint's first appearance, in 941 under Romanos Lekapenos, is recounted in the Life of Basil the Younger. Although this is a work of hagiography, it includes detailed descriptions of a number of historical events from the early to mid tenth century and seems to have been written by a contemporary. It relates Basil's prediction that the Rus would attack the capital of Constantinople and that the defensive operation would be led by a number of high-ranking officers as well as "Theodore the most holy general who has the surname Spongarios." They would be aided by "the Mother of God of the heavenly powers and all the saints" to defeat the enemy. Everything came to pass as Basil had predicted, and the Life describes the rout of the Rus in considerable detail. Theodore's epithet has generated a certain amount of controversy: some scholars have interpreted it as a personal name, meaning that the hero in question would have been a member of the mortal army rather than the heavenly one. It is more likely, however, that it is a corruption of 'Sphorakios,' the designation of Theodore's oldest church in Constantinople. Although this church was built in the fifth century and hence originally dedicated to Theodore Tiro, the confusion surrounding the identities of the Saints and their sanctuaries makes it entirely plausible that it could have come to be associated with Theodore Stratelates as well. Theodore Stratelates had the support of the Mother of God again in 971, during John Tzimiskes' campaign against the Rus in Bulgaria. The historian Leo the Deacon, writing soon after the event and using a source which is now lost, reports that a storm arose in the heat of battle, and "it is said that a man on a white horse appeared, riding ahead of the Romans and exhorting them to advance against the Scythians ... From this the indisputable assumption emerged that it was the great martyr Theodore, to whom the emperor used to pray to stand by him as an ally during the battles to rescue and save him together with the whole army." On the evening before the battle, Leo continues, a nun in Constantinople had a vision of the Mother of God calling for Theodore, who is described as wearing armor when he appeared before her. Mary told Theodore to go help Tzimiskes, to whom she referred as "your John." To show his gratitude towards the Saint's intercession, Tzimiskes renamed the city of Dorostolon as Theodoropolis "for the general and martyr Theodore Stratelates" on his way home from the campaign. During his victory parade, furthermore, he insisted on walking and placing an icon of the Mother of God in his chariot. This passage reveals that Tzimiskes counted on Theodore as a protector on the battlefield and prayed to him regularly in this capacity. Mary's reference to the close connection between the Saint and the Emperor is a further indication of Tzimiskes' devotion. John Skylitzes, writing about a hundred years later and using the same source as Leo, left this account broadly intact but changed or added a number of details. He mentions that the battle in which Theodore appeared took place on his feast day, calling him "victorious martyr," but does not specify the date. Leo's account states that the battle took place on Friday, 24 July, although it has been pointed out that in 971 that day was a Monday. This feast day may refer to the joint feast day of Saints George and Theodore on July 21, which was new or not known to everyone at the time (St. George had also performed a miracle at this time for the emperor and his army). Skylitzes goes on to describe how Tzimiskes sponsored the construction of a new and extravagant church in Saint Theodore's honor following the battle, and there his relics were deposited. He claims, however, that Tzimiskes renamed Euchainia, rather than Dorostolon, after Theodore. Despite this difference, neither city seems to have ever used the name. John Zonaras says that Tzimiskes built the church dedicated to Theodore "in Euchainia or Euchaita." It should be noted that Euchainia was associated with Theodore Stratelates, while nearby Euchaita was associated with Theodore Tiro. These battles with the Rus are extraordinary because they mark a new stage in the actions of Saint Theodore Stratelates. Whereas in previous centuries he had been known to help with the defense of his native city of Euchainia, the tenth century battles appear to have been the first occasions on which he came to the aid of an operation led by an emperor far from the Saint's homeland.